While we are preoccupied with new Nokia phones mostly, the real Nokia is also busy not only with the creation of new 5G radios and software but with some other quite useful technologies. One interesting thing that Nokia has been testing together with Finnish operator Telia, and a company Sensible 4, is Juto. If you are a Finn, then you probably know that Juto is a word for a reindeer who always finds its way to home despite the weather condition (I didn’t know that). That word is an appropriate name for the self-driving vehicle that uses the 5G network to communicate with Nokia command center in real time. The small autonomous car that resembles to actually is Renault’s Twizy, is equipped with different sensors like radars, laser scanners, and cameras, to sense its environment. But, that won’t be enough for the real-life conditions where this kind of vehicle will have to track many more things and communicate in real time with other vehicles, traffic infrastructure like traffic lights and road signs, other networking infrastructure, maybe some cloud services, but also with passengers and pedestrians. Nokia’s 5G networking equipment and command center come in handy there. Nokia has been working for some time on LTE based car communications and is a member of the 5G Automotive Association (5GAA), a strong proponent of 3GPP’s cellular-based technology called “cellular vehicle to everything” (C-V2X). This will enable the wide variety of communications that will be needed for the autonomous cars to run freely in our cities. 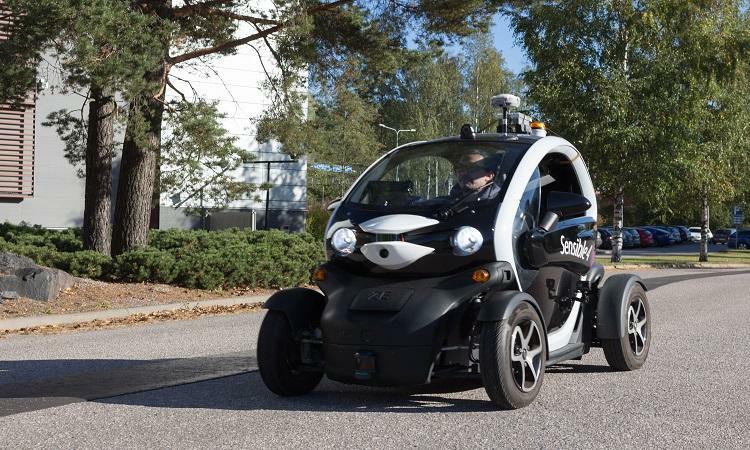 Nokia is doing tests of Juto on the streets of Espoo, and maybe we’ll see it elsewhere. Check out the promo video to see how the tests are going and what has been done.